-After a little time off for the thanksgiving break we are back with a new infosheet. Two Norovirus outbreaks recently came to light. 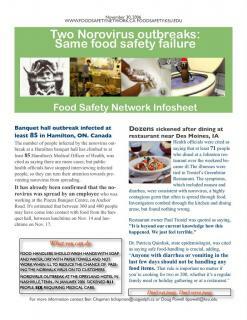 -These incidents happened in Hamilton, ON and Des Moines, IA. Handwashing could have prevented these outbreaks. « E. coli link steers some from deli in Chapel Hill N.C.